The anatomy of the elbow joint is shown in Figure 20-7. The joint movements at the elbow are flexion and extension and supination and pronation. These motions are illustrated in Figure 20-8. The anatomy of the wrist and fingers is illustrated in Figure 20-9. The joint movements at the wrist are dorsiflexion (or extension) and palmar flexion and supination and pronation. These motions are illustrated in Figure 20-10. 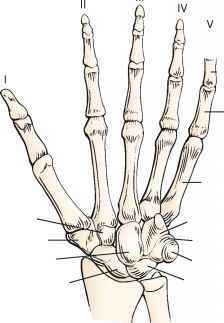 The joint movements at the fingers are abduction and adduction and flexion. These motions are illustrated in Figure 20-11. The joint movements of the thumb are flexion and extension and opposition. These motions are illustrated in Figure 20-12. 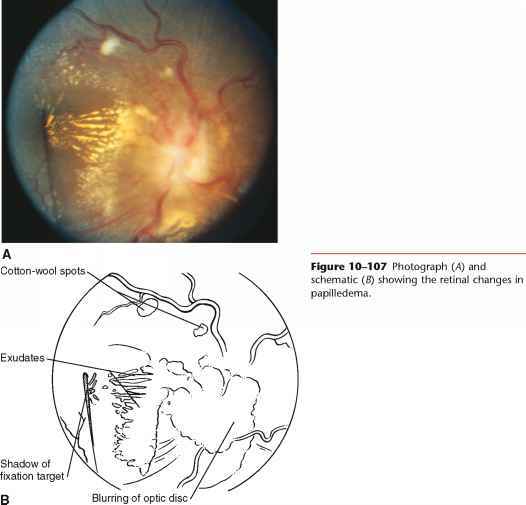 The anatomy of the hip is illustrated in Figure 20-13. The joint movements at the hip are flexion and extension, abduction and adduction, and internal and external rotation. These motions are illustrated in Figure 20-14. 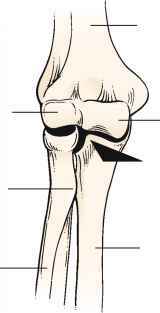 The anatomy of the knee is shown in Figure 20-15. The joint movements at the knee are flexion and hyperextension. These motions are illustrated in Figure 20-16. Figure 20-4 Range of motion. 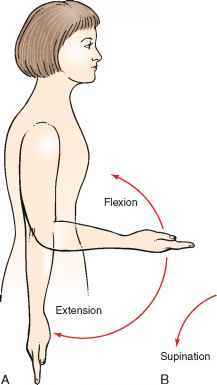 Rotation so that the palmar surface of Elbow, wrist the hand is directed upward beyond the zero position is called hyperextension. the midline is an imaginary line through the middle finger or middle toe, respectively. 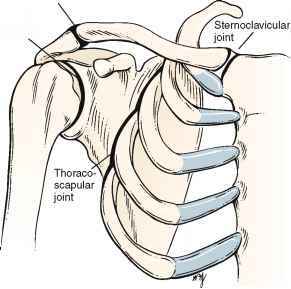 Figure 20-5 Anatomy of the shoulder joint. 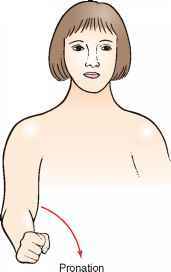 Figure 20-6 Range of motion at the shoulder. 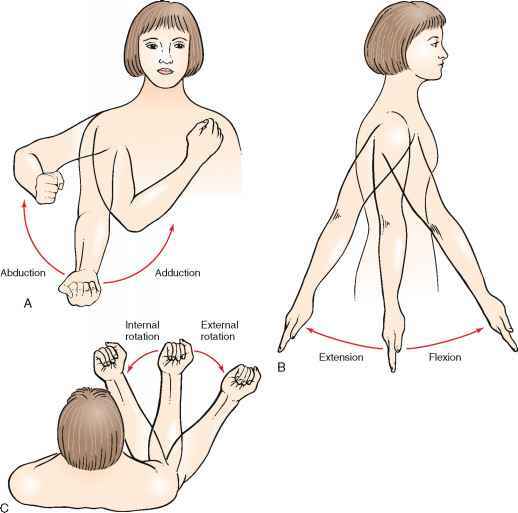 A, Abduction and adduction. B, Flexion and extension. C, Internal and external rotation. Figure 20-7 Anatomy of the elbow joint. 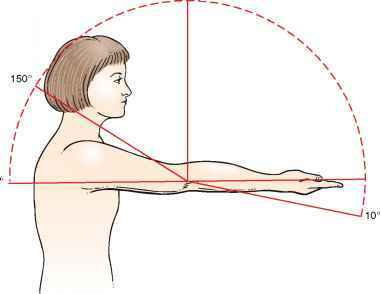 Figure 20-8 Range of motion at the elbow joint. A, Flexion and extension. B, Supination and pronation. Figure 20-9 Anatomy of the wrist and fingers.